Eucalyptus oil is distilled from the leaf of eucalyptus, eucalyptus is indigenous to Australia, Chile, Portugal, South Africa, Australia, China and Spain produce around three thousand tons of the oil. 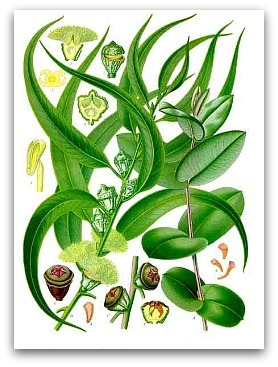 Three types of eucalyptus oil are produced. The most well known eucalyptus oil is extracted from eucalyptus globulus. There are many eucalyptus oil uses; historically it has been used for colds, influenza and bronchitis and is still used today. It is also used for arthritis, sinusitis, sore throats wound healing, tuberculosis, aches, pains and malaria. In 1788 two Australian surgeons, John White and Dennis Considen treated marines and convicts using distilled eucalyptus oil. The Victorian Botanist Baron Ferdinand von Mueller noticed the qualities of the Eucalyptus and encouraged pharmacist Joseph Bosisto the oil's potential commercial value. In 1852 Bosisto started up his own commercial eucalyptus oil company close to Dandenong, Victoria, Australia. His product Bosisto's eucalyptus oil is still around today. Eucalyptus oil can be found in many products such as ointments, inhalants, lozenges, cough sweets and of course, it is available in liquid form. In a study published in Pharmazie in 2001, researchers at the University of Heidelberg in Germany tested eucalyptus oil's anti-viral activity against the herpes simplex virus type 1 and herpes simplex virus type 2. The results showed that eucalyptus oil had some anti-viral activity against the viruses. Thus the researchers concluded eucalyptus oil showed promise as an antiviral agent against recurrent herpes infection. Eucalyptus oil should not be ingested or directly applied to the skin if it is not first diluted and it also unsafe for children. Ingesting undiluted oil may prove to be fatal. Signs of poisoning include muscle weakness, stomach pain, and dilation of eye pupils, dizziness and a feeling of suffocation.